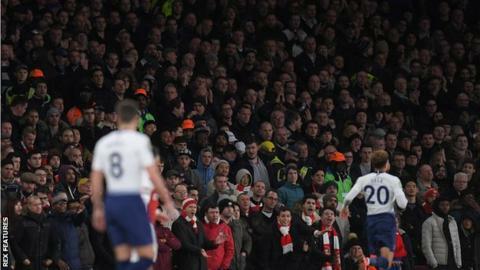 Arsenal are investigating allegations of anti-Semitic behaviour by their fans during Wednesday’s game with north London rivals Tottenham. Spurs won the Carabao Cup quarter-final 2-0, with goalscorer Dele Alli being hit by a plastic bottle thrown from the home section in a separate incident. Now Arsenal are also looking into alleged offensive chants and gestures at Emirates Stadium. “We are aware and are currently investigating,” a club statement said. Tottenham have a large Jewish fanbase. The Gunners have said they will ban the person who threw a bottle at Alli. Earlier on Thursday, Arsenal and Spurs were fined £45,000 and £50,000 respectively for failing to control their players in a Premier League game on 2 December. London neighbours Chelsea have been highly critical of some their fans for singing offensive chants about Jewish people in recent weeks.